Buy works – Bashindzhagyan Gevorg Zakharovich | (1857, Sighnaghi - 1925, Tiflis). Bashindzhagyan Gevorg Zakharovich (1857, Sighnaghi - 1925, Tiflis). 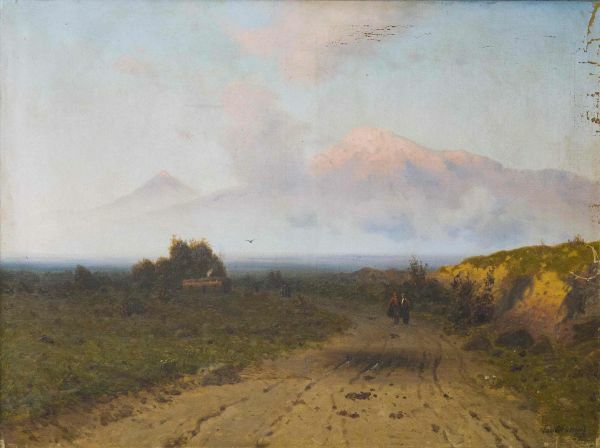 An Armenian painter-landscape painter received his art education first in Tiflis in the Drawing School at the Caucasian Art Society (1873-1878), and then at the Academy of Arts in Petersburg, where in 1879-1883 he studied with Mikhail Konstantinovich Klodt. He graduated from the Academy with a silver medal (awarded for the painting "Birch Grove"), which gave him the right to receive a scholarship for travel throughout Europe. In 1883 he traveled to Armenia, in 1884 - to Italy and Switzerland. Then, until the end of his life, he lived in Tiflis, moving from there to various regions of Transcaucasia. In 1899-1901 he traveled to France. He died in Tiflis in 1925. Signed and dated lower right. Certificate of I.E. Grabar All-Russia Art Scientific Centre of Restoration. Sold. Lake Sevan in the moonlight.